This is a long review that I wrote which hopefully will appear, at least in part, in our local newspaper. It wasn’t written for a religious audience, although I think most BookNotes readers won’t mind that lack of Biblical references. Author Patrick Radden. Keefe hopefully will be on NPRs Fresh Air later this week, and he will be doing a book launch of The Snakehead here in York on Sunday, August 2nd, since some of the story is set here. I’ll try to get our poster about the event up on Facebook, perhaps. Do call us if you need more information. The store is mentioned in passing, by the way, in this prestigious new work, a book which explores Chinese immigration, human smuggling, and the treatment of those seeking asylum. Pretty amazing stuff, in a very handsome, thick hardback. 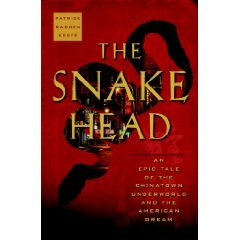 There is an extraordinary website that Patrick has done for the book, so after reading my review, please check it out here: www.thesnakehead.com. I can remember the conversation like it was yesterday. I recall planning the subsequent protest/prayer vigil at York County Prison, the guns aimed at us there on Concord Road, the impromptu press conference. I recall the natural leadership of my dear friend and local United Methodist pastor, Joan Maruskin as she stepped–pushed by the Holy Spirit, she might say—into the local and national limelight. I will never forget the gladness in the moment we met the savvy and passionate—ticked off with righteous indignation, he might say—small town Republican lawyer, Craig Trebilcock. It was obvious that he was willing and able to speak to prison officials and TV reporters and the array of religious human rights advocates gathered at the prison. It was early August 1993. It was one of the most important days in my life as it started an involvement with the local support group, People of the Golden Vision, gathered to demand fair asylum hearings for dozens of Chinese immigrants detained by the INS, sent oddly to our central Pennsylvania prison. 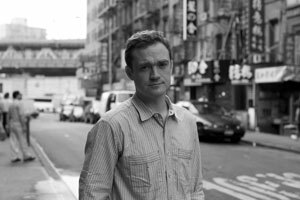 When The Snakehead author Patrick Radden Keefe writes of that day, halfway through his sprawling epic of organized crime in Chinatown, climaxing in the study of human smuggling, including the Golden Venture detainees, my hands shook. To see an esteemed academic with publishing acclaim—his work gets on NPR and is reviewed at the major papers—was truly thrilling. Our inter-faith project to provide emotional, spiritual, and pro bono legal aid for this large group of Chinese refugees seeking political asylum as they were detained in York has been told in bits and pieces; local papers did an admirable job covering the plight of the men and women being detained and the labyrinth of government repression (in Tiananmen-era China and Clinton-era USA), not to mention the local efforts to assist them to freedom. Our populist by-the-seat-of-our-pants uprising on behalf of fair trials and just renderings of perplexing asylum law has been written in magazine articles, a documentary film, and in the novel written by Rod Merrill, the schoolteacher turned song leader for the weekly vigils. But this prominent work–Keefe has degrees from Cambridge and Yale, and writes for the likes of The New Yorker, is, if I may say so, the big time. Local folks are rightfully very proud and eager to hear what this observer has written. When the Golden Venture immigrants left the Fujian Province on their several month journey, one could possibly get legal, political asylum in the United States, seeking freedom from forced sterilizations and abortions as the draconian Chinese health cadres enforced the one-child only policy there. President Clinton reversed the Reagan/Bush polices, so even as the horrific stories were told, and often verified, like the heart-rending story of Pin Lin, Craig Trebilcock’s client, (well-told in The Snakehead) the INS refused asylum and began deportation proceedings. We had reason to believe, as did the immigrants, that such deportation would most likely lead to their severe persecution or death back in China. Our new Chinese friends, seeking the American dream and freedom from communist repression, were in very serious danger. Our campaign did get national attention as we corresponded anyone who might help, from Amnesty International to embassies and dignitaries. We spoke with reps from Oprah, Pope John Paul II, and, through a personal friend, President Clinton himself. Hillary went to Beijing, immigration issues were becoming more contentious, yet our local story was impressive. We ended up sharing cover space in Life magazine with the U.S. Olympic Team. Still, we struggled to tell our story, lobby, write, vigil and pray. Rod Merrill released his CD of “Freedom Songs” and anti-Communist conservatives (literally) joined hands with ACLU liberals. Republican and Democrat congressional staffers attended our vigils (although usually stood to the side.) We had agnostics and Buddhists and fiery evangelicals, praying, singing, working, in any way they could. I preached most weeks, my Bible still stained from rain and sleet. Dissident Chinese leaders and journalists for the Asian presses visited. Our guys remained in jail, the women moved to a hellhole in New Orleans, and some of us road-tripped there to visit. Year after year after year the wheels of injustice turned, slowly, as we resisted, case by case by case. The Snakehead is a riveting true crime expose, an expose that took the author into the Byzantine web of the Chinese underground, an organized crime network as complex, nuanced, storied, and violent as the Sicilian Mafia. Much of this book reads like Mario Puzo, except deals and murders happen over Chinese take-out on East Broadway in the shadow of the Brooklyn Bridge, not over wine in Little Italy. Imagine The Sopranos without the pasta. In these years, we wondered about the bigger backstory of how these immigrants ended up in the shipwrecked freighter. We had heard of the money owed to the “snakehead” organized crime leaders like Sister Ping who bought the old freighters and bribed the international harbor officials from Kenya to Belize, Thailand to Panama. The prisoners told us about the horrible conditions on the vessel, those who had died, the mutiny at sea when the plan when weird. Odd stories circulated although we had little time to explore these larger international dramas. New information, twists and fascinating surprises emerged as Keefe sleuthed around the world, digging into places perhaps no one has so thoroughly gone. The Snakehead offers this narrative, the biggest possible picture and it is at times breathtaking. Mr. Keefe was drawn to this story, he told us during one of his research visits to York, when he covered for The New Yorker the trial of Cheng Chui Ping, aka Sister Ping, who, by the late 1990s had become the FBIs most wanted Asian criminal. To understand why the Chinese-American community (especially the prominent Fujian community) so loved her–seen even as a Robin Hood figure—Keefe followed the story into the subculture of Asian immigration, which lead him to China, Burma, Africa, and Central America. And, finally, to York, Pennsylvania. Our local support group, People of the Golden Vision, is well described in The Snakehead and that is reason enough for shelling out for this large study. To hear about the intricately constructed “freedom birds” made by hand in the prison, to hear the stories of the men some of us knew so well, to learn about home-grown, bi-partisan activism, the way local churches were involved, and the work of members of the York Bar Association, is wonderful. I feel deeply blessed and grateful, perhaps somehow validated, to have a prominent journalist tell this story in a solid public affairs venue like Doubleday. Our group gave years of our lives to this local cause; marriages and work and churches and careers were effected. I cannot imagine how the refugees themselves, or the INS judges or other principles, will feel, seeing their names in print. It is instructive and good to read about it, whether one lives near here or not, and the author deserves our appreciation..
Keefe is not a partisan as he tells the tale. He is a good writer, a good reporter, a well-informed scholar making him a very keen observer, and he knows enough to know that every story has many sides, history unfolds within a mix of people, places, principles, passions, policies… Was there evil-doing behind the forces that brought the Golden Vision men to York? Yes, yes, more than we ever knew! Was there injustice shown to decent freedom-loving immigrants? Yes, yes, and Keefe tells that, too. I might have wished for more, since the local lawyers and advocates saw such abuse of raw power against the vulnerable. But he allows for various views, telling different sides and interviewing different key players in the story. In Keefe’s hands, the subtitle of The Snakehead—“An Epic Tale of the Chinatown Underworld and the American Dream“–is shown as a story which spans continents and centuries; people are treated well, or not, as large social forces shape international affairs, immigration policy, prison conditions, public sentiments and stuff as arcane as asylum procedures and small efforts to achieve detention reforms. Topics as large and detailed as abortion, racism, human rights, crime, religion, personal vendettas, and ethnic tensions float in and around this epic story. Why did some of these young men and women choose the dangers and risks of illegally leaving their homeland? Did they know they were being used by seriously organized criminal elements? Why did Mr. Clinton ignore their pleas for so long? (Why, in fact, was not the ship stopped before it ran aground, since it was being watched by intelligence?) What international issues shaped individual policy positions, and what ramifications did this have on folks in the Chinese Mafia, or our heroes being held in the York County jail? Is there a lingering connection between anti-Asian biases in 19th century immigration law and the practices of today? Much is learned here that is important for our times and it would serve us well to think deeply about these matters of ethnic assimilation, immigration policies, the meaning of citizenship, and how our deepest worldviews shape our perceptions of race, justice, rights, law, and hope. Much is contested in our times, and as our global realities flatten and the world shrinks, where this all will lead is anyone’s guess. We need to be thoughtful and well equipped for helpful responses. I cried when I closed this book; obviously those named in the book, and those who were deeply involved in the PGV are invested, as they say. Still, it is a moving story for any reader, this tale of hard and painful risk, this life-or-death voyage for freedom, this vision of the American Dream, soured by corrupt Chinese crooks and confusing U.S. public policy. And, somewhat redeemed by local folks acting in good faith, offering hospitality and the plea for justice. Every shipwreck tells a story. And if this particular story is in some ways an unhappy one, it is also a story about the awesome power of optimism and bravery and hope, about the many twisting paths that bring strangers to this country, and about what it means to be–and to become—American.